Pro: It’s safe to say Army Chief of Staff Gen. Ray Odierno’s straightforward, heartfelt delivery is the best public-speaking performance given by a four-star general while flanked by a mule and a guy in a knight outfit so far this year. Con: The general has comedy chops — maybe not a performance pedigree at the level of his predecessor, but comedy chops nonetheless. Playing it straight doesn’t show off his range. Verdict: Our friends at Army Times’ Outside the Wire blog haven’t been impressed with the Army’s spirit-spot performance thus far. This outing likely won’t move the needle in that regard. 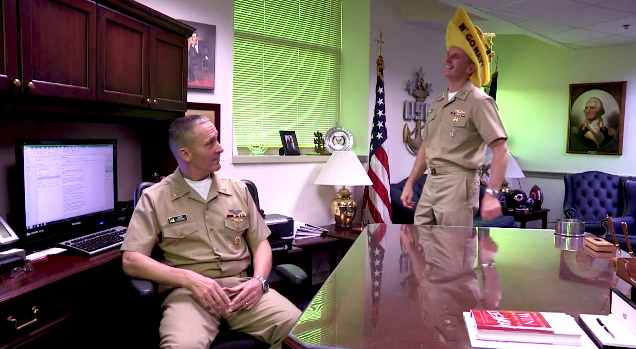 Con: None to speak of — for entertainment value, it’s tough to argue with a four-star admiral wearing a yellow foam ship on his head. And it’s a departure from last year’s video, which offered the more standard mascot-crowd motif. Leave us your captions, and links to your favorite spirit spots, in the comments below. Watch some earlier videos featuring lower-ranking personnel here and here.